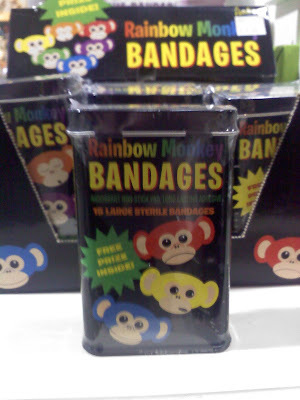 Those aren't REAL officially licensed Rainbow Monkeys! 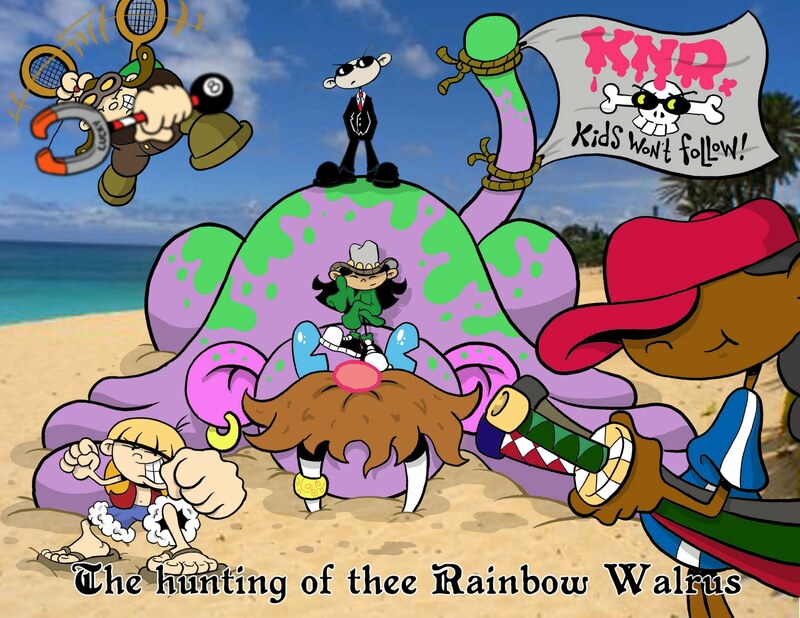 Cartoon Network might have to get their cease and desist letters on! 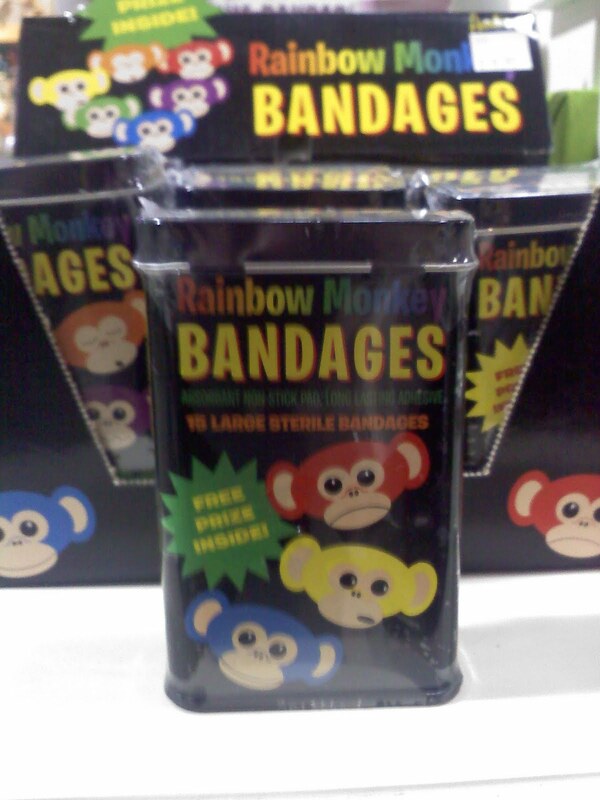 Or at least put out some REAL Rainbow Monkey products, right? So Mr. Warburton, you just joined a production a month before it premieres! Yup... The House of Mouse was kind enough to give us the day off to go to The Happiest Place on Earth before watching the sooper exciting world premiere of Fish Hooks! Well, either he's excited or just got goosed by Donald Duck. It's hard to tell. It was cool to see how many kids actually recognized the show when they saw these things, especially because there were only a couple sneak peeks on the air before the big premiere. "Your new family is the next one that walks by with someone wearing Crocs." "The next family that walks by with someone eating ice cream is your new family." Sometimes we were very happy with our new family. Sometimes we were very, very scared of our new family. But it was always fun. Anyway... we did lots of awesome stuff all day. Usually we'd run into another group of Fish Folk and we'd cross pollinate into new groups. It was a good day for not-so-long lines, too! And I ALMOST went on Splash Mountain but bailed when I saw how wet people were getting. I mean, I didn't wanna go to the premiere party soaking wet! Speaking of which, after going out to a nice, if not hurried dinner, we all gathered in a conference room in the Grand Californian Hotel for the premiere! See that guy with the poo-poo face? 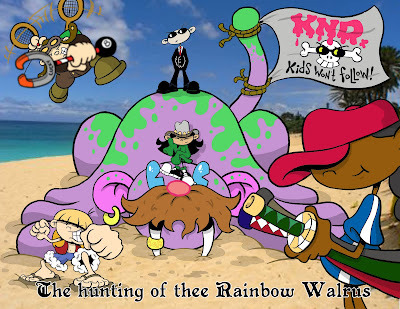 My former Evil Apprentice on Codename: Kids Next Door. 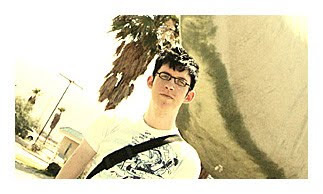 He thought he could escape me by running away to Los Angeles and drawing storyboards. And that's why he's making that face. 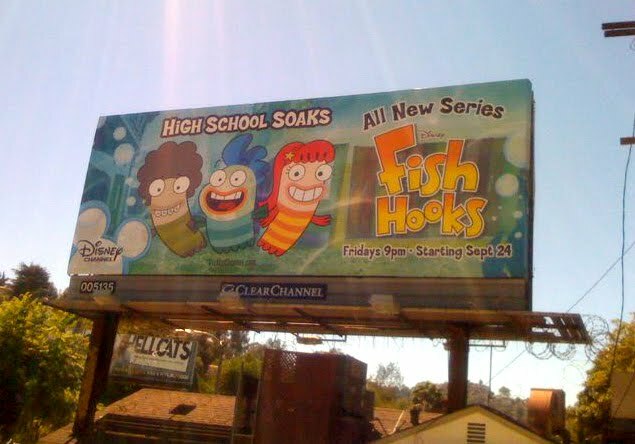 Watching Fish Hooks go on the air FOR REALS. Sooper triple massive congrats to Mr. Jones, Executive Producer/Samurai Executioner Maxwell Atoms and EVERYONE who made this thing happen! First season is always a killer and you guys busted your butts to make a rockin' show! Now let's hope I don't ruin it! I don't know about you guys, but me and the FH crew are taking the day off and going to Disneyland to celebrate! How he's a bad person for preferring dark chocolate over milk chocolate. How I'm a bad person for not reading books detailing the criticisms of the criticisms of the fabric of hats worn on the Great Silk Road of China during the Late Crustaceous Period of Boredom. in a game of jeu de boule. And/or about who's getting better looking as they get older. Inbetween all that fascinating rot, Mo brought up a sooper secret project that he asked if I wanted to contribute to. I mean, it's been eleventy eight years since we sat around making up stupid stuff together! It was also a good excuse to hit NYC for some meetings I needed to have with some publishers. So I booked up a flight and hit the road (er... air). Once there, I made my way up to Northampton, MA where I was graciously received at stately Knuffle Manor by Mo and his family. I hadn't been up to visit since they moved there two years ago so a tour was in order and, of course, the house rocks like a hurricane. Especially the chalkboard walls in the dining room. What? You don't remember reading about those over HERE? And those walls got put to good use during the party Mo was awesome enough to throw while I was in town. See, there are a LOT of writers and artists who live in Northampton. You can't throw a rock without hitting at least three. But there weren't just artists and writers there. An AI specialist named Lee wrote this formula on the wall. I think it's the key to happiness. And what's a party without Cherry Man? So after all this fun, I went to bed very happy (and very late). Old friends, new friends, yummy food, lots of root beer and many, many laughs of all sizes. It was almost a shame to have to work the next day. Who can call it work? As I mentioned in my last post, I'm working on a sooper triple funny called FISH HOOKS right now. And no, I didn't create it. 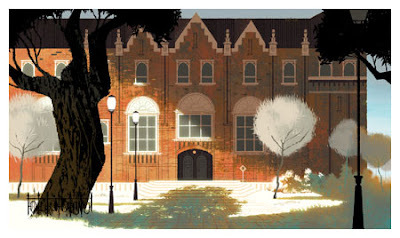 That's picture book illustrator Noah Z. Jones right there. And while he definitely knows his way around an animation desk, he's never really worked on, let alone run his own sooper big network show before. 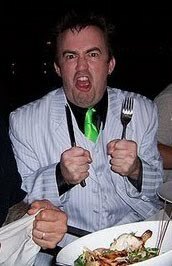 Maxwell Atoms is the Executive Producer/Show Runner/Big Cheese/Judge/Jury/Executioner and Head Pizza Chef of Fish Hooks. 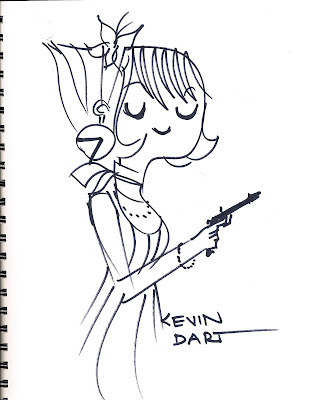 So a while back, he asked me if I wanted to write some stories for the show and maybe do a storyboard. And OF COURSE I wanted to write some stories! Storyboarding is pretty intense stuff. Especially when you're 'boarding your story from an outline instead of a script. You've gotta be an artist, a writer, an actor, a director, a draftsman, a comedian, a storyteller, an editor, a location scout, sushi chef, lumberjack as well as a 1000 other things. And you've gotta do it all on a deadline! I tried to talk my way out of it, but Mr. Atoms turned into a were-gorilla and shook me around until I agreed to do it. And I was doing a storyboard digitally for the first time so I had to learn how to use Toonboom's Storyboard Pro (which, BTW, is pretty awesome). Like I said... pretty intense. And after a grueling 4.5 weeks, I had to get up and perform my story for the bigshot Disney executives along with the whole Fish Hooks crew. And for me... that's the easy part. I mean... I had to get up and perform a billion KND stories in front of people all the time! But back then, if someone didn't like my story-- I could fire them. Not so this time around! I didn't embarrass myself (or Mr. Atoms). And no one threw anything at me. And then I had a (very relieved) week and a half to finish up the board. See, between Pre-Production (writing, designing, storyboarding, etc) and Post Production (calling retakes, spotting music and sound FX, editing, mixing, etc) Mr. Atoms was up to his vampire-bitten neck in craziness. So now it's my job to help him out! I'm kinda doing a little of everything-- Post Production, Pre-Production, hanging out by the pie table at the Disney commissary, etc. In other words... I get to work on a fun show, hang out with Maxwell Atoms all day, work with an awesome crew, AND get paid for it?! But don't worry... I've got lots of my OWN projects in varying stages of development! Keep it locked here so I can tell you about them! 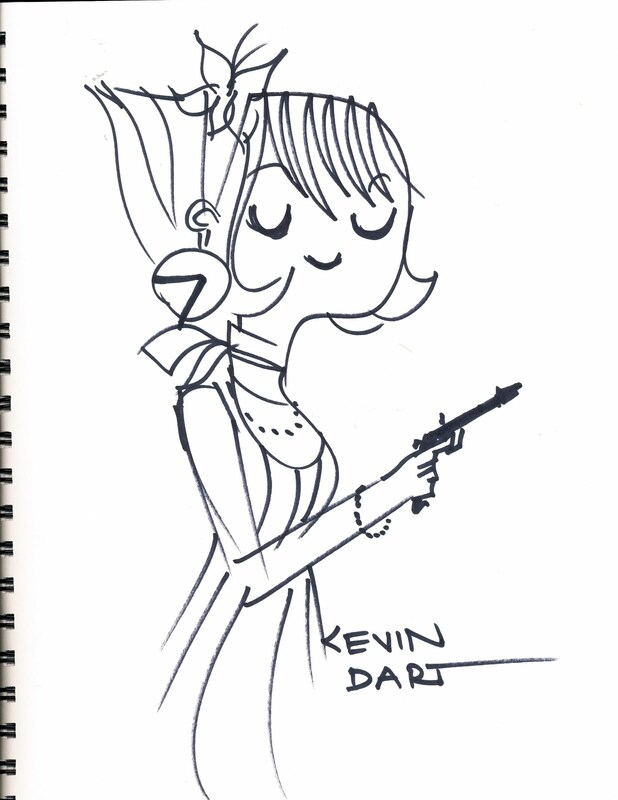 That was the sound of another sketchbook being closed. As you can see, this one rocked from June 25, 2010 to September 10, 2010. And what kind of oddities have been sealed into this one? 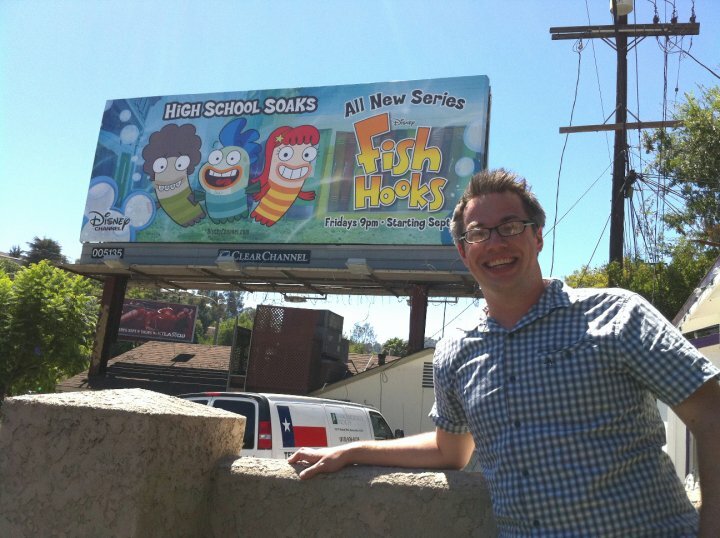 This here funny picture by Noah Z. Jones, creator of Disney Channel's upcoming sooper giant huge funny new series, FISH HOOKS! I'm working on Fish Hooks now! Well, then I guess we have lots to talk about in the next post then! Yeah, that's Yuki 7 by sooper awesome illustrator/designer/background artist Kevin Dart! 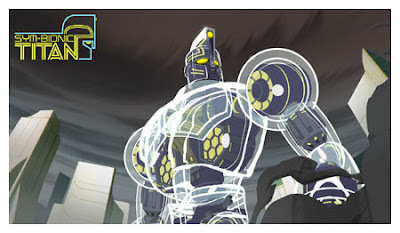 Currently he's doing some BG painting on Genndy Tartakovsky's new Cartoon Network series Sym-Bionic Titan! If you wanna see more... just head on over HERE! After I bought my Cintiq drawing tablet I spent a lot of time experimenting with it by giving myself little projects... and this was one of 'em! I sent it to Shonen Jump to see if they wanted to print it but never heard anything back. This print DID get published in Shonen Jump! we sell copies of it in the mighty printlab! And to celebrate we're puttin' on a sale! So go check the printlab, okay?